The climate of the island of Yakushima is humid subtropical, with mild winters and hot and muggy summers, and it's famous in Japan for being rain-soaked all year round. 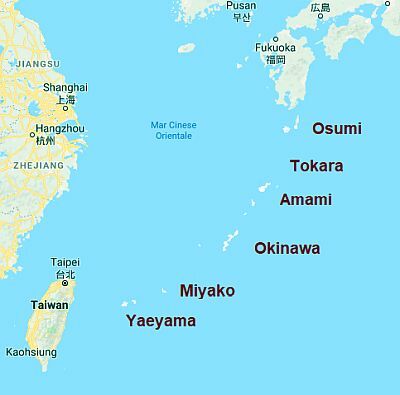 The island is located at the 30th parallel, south of Kyushu, and along with other islands such as Tanegashima, Kuchinoerabu-jima, Kuroshima, Iojima, is part of the Osumi islands, the northernmost of the Ryukyus. In winter, it is affected by weather disturbances, due to the clash between cold air masses coming from the Asian continent, and the mild and moist air masses that are found in the East China Sea. In summer, there are periods of bad weather due to the summer monsoon, as well as to typhoons. The temperatures are similar to those of Mediterranean islands, such as Sicily. In winter, the temperature never drops below freezing, but there may be cold periods, when highs drop below 10 °C (50 °F), the wind blows, and lows approach 0°C (32 °F). In summer, hot and sticky weather prevails, although sea breezes blow. As mentioned, precipitation is very abundant: on the coast, even more than 4 meters (14 feet) of rain fall per year, of which 770 millimeters (30 inches) fall in June, the wettest month. In the interior of the island, on the slopes of Mount Miyanoura-dake, 1,936 meters (6,351 feet) high, the situation is even worse, since precipitation reaches 10 meters (33 feet): so this is one of the rainiest places in the world. The mountain is covered by a famous forest, visited by many tourists and protected by UNESCO; it hosts ancient cedars, the most famous of which is called Jomon Sugi, which is 25 meters (82 feet) high and whose age is estimated at least 2,000 years. The tree is located at 1,300 meters (4,300 feet) above sea level. In winter, the mountain can be covered with snow. On the top, the temperature is on average 11.5 degrees Celsius (20.5 °F) lower than in the plain (and the difference becomes even greater during outbreaks of cold air). As mentioned, in summer and early autumn, from June to October (more likely from August to early October), Yakushima can be affected by typhoons, the tropical cyclones of Southeast Asia. 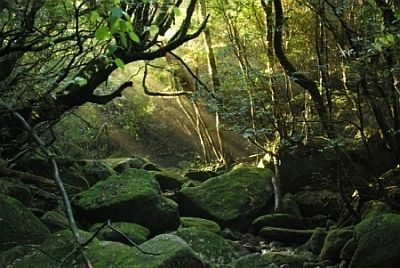 The amount of sunshine in Yakushima is scarce in winter, when cloudy skies prevail, it is mediocre in spring and autumn, while it is decent in July and August, at least on the coast, when the rains are still abundant, but they are not so frequent, and there are 6.5/7 hours of sunshine per day. The sea in Yakushima is cool in winter, but not impossible for a swim; it's warm enough for swimming, with a temperature equal to or higher than 23 °C (73 °F) from May to November, and it becomes pleasantly warm from July to September.